What the Flux is Blue Light? 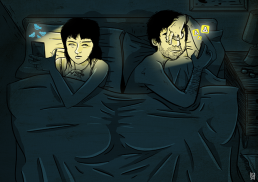 If you are like me, you probably can relate to the scene in my illustration – people in their bed with the light of their iPhone blinding them. In the creative field, we often have to work late into the night on computers, obsessively staring at the screen, especially for the fine tweaks and last minute touches. My personal experience has seen me having to invest in a pair of glasses which help stop glare. This was also down to the fact that I had a very short blinking cycle. I have perfect vision, but the screen made my eyes vibrate and spasm, even away from the computer. Another effect I found, was feeling drained and fatiuged in the mornings, which I especially felt If I was staring at the blue light of my phone before sleep. Blue light is apparently a big concern. Blue light? The way it works is, the blue range of the colour spectrum basically kick starts our brains in the morning and afternoon, then when dusk comes the soft orange and yellow hues of fire or candlelight, brings our mind into balance and releases melatonin for natural sleep – the way of our ancestors, pre-tech. The latest reports and studies have suggested that blue light emitted from a device like an iPhone, iPad, computer monitor etc, has detrimental effects on our quality living. These range from lack of focus, irritability – right up to cancerous issues due to the lack of melatonin produced in the pineal gland at dusk. For me, I like to keep an open mind on everything, so while this whole thing might seem a bit woo-woo new agey, it is worth noting that our relationship with blue light in the evenings is relatively new – very new in fact. Upon reading up on this information, I was introduced to a clever app called Flux, which works in sync with your computer (soon to be mobile) in creating a blue light free work experience at dusk in your time zone. So far I’ve noticed my eyes definitely don’t sting as much, and my concentration has improved also. The only drawback for designers is that the 0n-screen colour gets changed drastically, so it might be a good idea to turn it off and on if you are colour matching! All content © copyright Lee Grace. Any views expressed are my own.